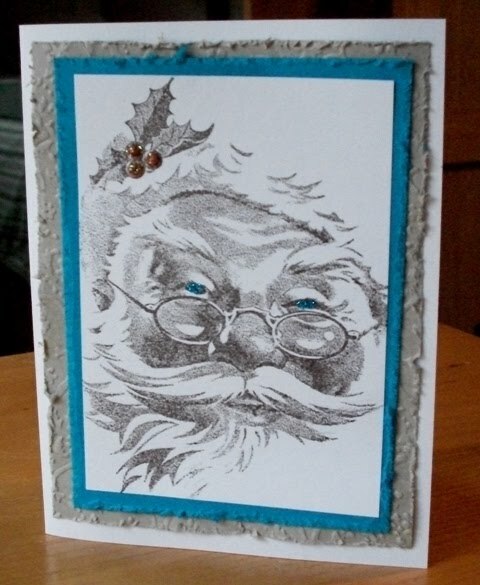 The first one is NOV10VSNA to make a Christmas card without using red or green. 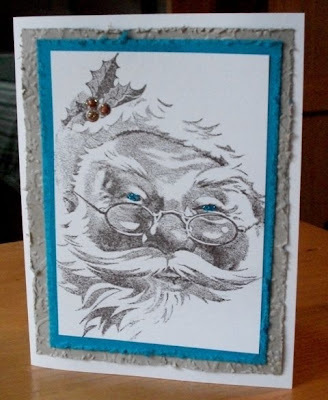 I chose this wonderful old time Santa from Flourishes. I used Taken with Teal and Fruit Punch Stickles for my alternative to red and green. Fruit Punch is a pinkish orange, not red. He was stamped in Chocolate Chip and left as a silhouette with his eyes and the berries on his hat stickled. Being left as a subtle image, the sparkle really brings it to life. Base card is white followed by a piece of Kraft embossed with the Textile EF and distressed. Taken with Teal was distressed next and taped down. The main image has been described and was not distressed.